Happy New Year to everyone! Thought I would have some time to finish the blog post series during Christmas holiday but I didn’t take my 3 little kids into consideration 🙂 So it’s now the first thing to finish this blog post. Why is it worth to mention NVENC support for Virtual Apps at all? RDSH works differently compared to VDI and uses a such called “offscreen buffer” instead of the possibility to leverage NVFBC. Therefore we are not able to use “native” NVENC. That said we couldn’t benefit from the mentioned advantages with previous releases of XenApp. For 1808, Citrix implemented a solution to benefit at least partly from our NVENC. Why partly? As we don’t have “native” NVENC due to the offscreen buffer handling we don’t really benefit from latency reduction as we need to copy the capture data between system memory and GPU memory. But we can benefit from CPU reduction for Encoding and we will also see better user experience. For XenApp workloads it makes no sense to use H.264 as default. 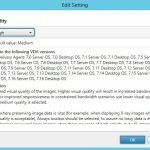 We expect office workloads most of the time in RDS sessions and therefore it is important to have the best image quality possible which leads to bitmap remoting. 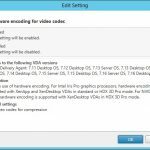 But multimedia content is getting more popular even for XenApp workloads and here we can benefit from video codecs like H.264. So this is the perfect use case for the “active changing regions” Adaptive Display explained in the previous blog post. To see the impact on NVENC I did a quick test with the known 2:30min video playback in window mode with and without NVENC usage and used GPUProfiler and RD Analyzer to compare the results. As we can see on the screenshots the main difference visible is the CPU encoder load which is slightly reduced with NVENC. Total CPU savings during this test is 4-5% CPU for this single user. So this is not much but if we scale up to 30 CCUs there might be a greater impact. In addition the test case with NVENC showed a more consistent load. I didn’t recognize a better FPS for this test with NVENC but I already heard from customers that they achieved smoother playback with Youtube videos, for example. Availability of NVENC with Virtual Apps is an interesting option to look at. We won’t get the same advantages that we get on a VDI with NVFBC enabled but we may save some CPU load and/or increase the user experience which should be the primary goal. I don’t have reliable load data yet for multiple CCU on a single VM with NVENC enabled so you should be carefully testing before running in production but I would give it a try.